HomeShop By CategorySolid Color Blank Rubber WristbandsSupport Law Enforcement Wristband Black w. Blue Line - Adult 8"
Show your support for the efforts of law enforcement who put their lives on the line to keep us safe. Classy thin blue line - no words - communicate the message with this band. 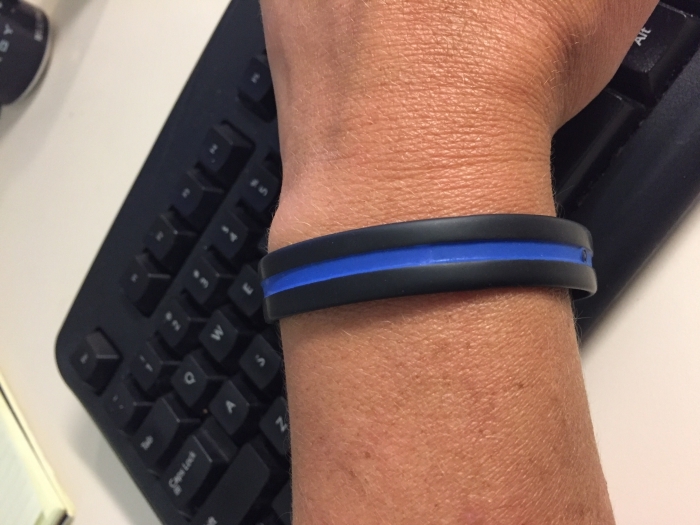 This SupportStore rubber wristband is 100% black silicon rubber with a debossed and blue color filled stripe that wraps all the way around. No words needed. Available in 3 sizes - this is the adult size, also available in youth and extra large, and comes in an individual polybag with the size indicated. Debossed (indented) wrap around thin line stripe filled in blue color on black silicon rubber. Great quality fast delivery will do business with them again ! What a great job putting this bracelet together, Great blue color and nicely engineered. Thank you. This was exactly what I was looking for. It was the perfect size. I'm very prood to wear this everyday. I love that it's silicone and that I can wear it to work and to bootcamp workouts. I even got a hug from a Sgt. here in Orlando! Bracelets are exactly as described. Fits great! Very sturdy! Highly recommend! Beautiful and I wear mine daily with pride. Great quality, durable and built to last! I will highly recommend to everyone I know ...(cousin just had to have my second one) At first I was highly upset but gave in because the more support/awareness for our men and women in Law Enforcement the better! Bought enough for the entire family to participate. The Large 8" is a great adult size. this bracelet is thick to withstand constant putting on and taking off and very comfortable to wear. I ordered one bracelet for myself (daughter of a fallen officer) and 2 for parents of a fallen officer. I am very happy with this item. Delivery was FAST. I WOULD NOT hesitate to order from Support Store in the future as this was my first purchase with them. The wristbands are a great quality material, order was processed quickly, would order them from Support Store again. These came quickly and I was able to give them out quickly to the wives of officers who were VERY appreciative!! I wanted something to show my appreciation and support of law enforcement other than a shirt or cap. This was perfect, I wear it all the time. This is a great product for those wanting to show support for law enforcement. Love them, can't wait until you get some more in. Best UsesGive to friends. Please call me when you get some more so I can place an order. Our local LEO support group was looking for an item we could purchase in bulk and sell to raise funds for our LEO support and found the bracelets to not only be what we were looking for but had great appeal when we began sharing them. Supporting not just law enforcement everywhere but my family is amazing! I purchased these bands for my entire Facility to honor the loss of one of of our own. I am very pleased with the quality of the band but more pleased with how they were received by our staff. The "thin blue line" means so much to so many and in this case has helped us in healing from the loss of Our Sister. Best UsesHonor fallen Officers or just to honor those currently serve and protect. My bracelet came promptly and it was a nice quality perfect weight, not cheap looking. Sizes run true, I'm a plus size woman and the large fit me with plenty of room to be loose and comfortable.